The biggest factor in whether you say wind turbines make you sick is someone telling you wind turbines will make you sick. That's the result of two new studies on so-called "wind turbine syndrome," reports DeSmogBlog's Graham Readfern. The response from the "high expectancy" group was to report that the "infrasound" had caused them to experience more symptoms which were more intense. This was the case whether they were exposed to sham infrasound or genuine infrasound. The report explains that "the number of symptoms reported and the intensity of the symptom experienced during listening sessions were not affected by exposure to infrasound but were influenced by expectancy group allocation." Another preliminary study from a public health professor at the University of Sydney finds "only a tiny proportion of people living near turbines do actually complain and, when they do, the complaints coincide with campaigning from anti-wind groups." 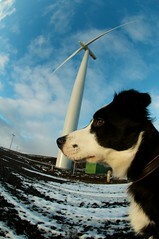 The studies reaffirm mountains of independent studies showing no direct health impacts from wind turbines. But they also confirm that, as Stephen Colbert detailed, if you get told they'll make you sick enough times, you might think wind turbines gave you herpes. I have never heard of wind power generation systems to cause har to human health. Anyway, I believe it is really a good imagination of thosem who is interested in sabotaging local energy policy.